In Jensen and Su (J. Pure Appl. Algebra 219(2), 277–307 2014) constructed 0-Schur algebras, using double flag varieties. 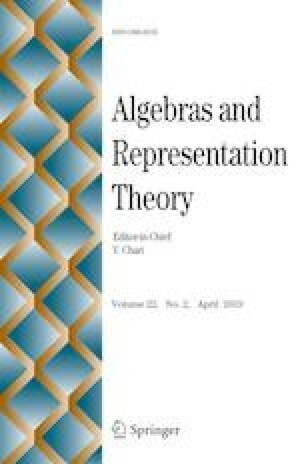 The construction leads to a presentation of 0-Schur algebras using quivers with relations and the quiver presentation naturally gives rise to a new class of algebras, which are introduced and studied in this paper. That is, these algebras are defined on the quivers of 0-Schur algebras with relations modified from the defining relations of 0-Schur algebras by a tuple of parameters t. In particular, when all the entries of t are 1, we recover 0-Schur algebras. When all the entries of t are zero, we obtain a class of basic algebras, which we call the degenerate 0-Schur algebras. We prove that the degenerate algebras are both associated graded algebras and quotients of 0-Schur algebras. Moreover, we give a geometric interpretation of the degenerate algebras using double flag varieties, in the same spirit as Jensen and Su (J. Pure Appl. Algebra 219(2), 277–307 2014), and show how the centralizer algebras are related to nil-Hecke and nil-Temperley-Lieb algebras. This work was supported by EPSRC 1st grant EP/1022317/1 and NSFC 11671234. The first and the third authors would like to thank the Algebra and Geometry group at the University of Bath for the hospitality during their visits to the department. We would like to thank the referee for helpful comments, which have improved the exposition in this paper, and especially for pointing out the reference  and it’s relevance to our results in Section 6.